I have a weakness for all things buffalo and bbq sauce related. These meatballs completely hit the spot when I’m craving something a bit more in the realm of comfort food. Pile these guys on a hoagie with a drizzle of ranch dressing; you’ve got yourself a meal. I love Sara’s recipe but I tweaked a couple of the proportions to make these meatballs just a bit more crisp while still soaking up the BBQ sauce. The blue cheese isn’t overpowering and plays nicely with the tang of the BBQ sauce (some things are just meant to be together.) 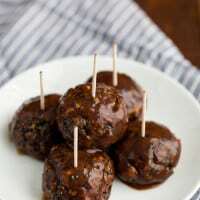 Of course, if BBQ sauce isn’t your thing, you can try your hand at buffalo lentil “meat”balls instead! In a large bowl combine all the ingredients for the lentils (through oregano). Stir until well combine. Let rest for 10 minutes while the oven preheats to 400˚. Measure out roughly an ice cream scoop worth of lentil mix and roll into a ball. Place on a tray covered with parchment paper or large roasting dish lightly oiled. Bake meatballs for 15 minutes, flip, and bake for another 15-20 minutes until crisp and firm. *I hardly ever buy breadcrumbs. Simply toast a piece of bread until crisp then pulse in a food processor until crumbly. Yum, these look delicious and I’m not even usually drawn to BBQ sauce! Can’t wait to try them…I’m thinking they’d also go great paired with a cauliflower mac & cheese! Oh my goodness, these look and sound just incredible – little umami bombs! Can’t wait to give these a try. Thank you for sharing! Hooray, meatballs! I bet these would be great with any number of cheeses, too. Maybe a sharp feta? Delicious! This looks like such an awesome recipe! I’m definitely making these…very soon! Yum! These plus swiss or gruyere on a sub? My ideal sandwich. I made these last night and they were amazing. I served them with chopped spinach over black quinoa. Thank you so much for your amazing recipes! I’m a vegetarian and my boyfriend is not – you make it so easy to please everyone! Keep on keeping on! That looks amazing! I love your recipes and the way you see food! You’re such an inspiration! I just made these. OH MY GOSH! They are so delicious. I wanted to lick the plate! Okay, okay…so I did lick the plate. I was alone. Nobody saw it. These sounded so good and I just happened to have some blue cheese that needed to be used up…. I did not however have ricotta cheese but I otherwise followed this recipe to the T. For whatever reason they were crumbly and didn’t keep their shape very well. Unfortunately the ricotta is pretty integral to the integrity of the meatball and why yours didn’t keep their shape. My omnivore husband is OBSESSED with these! They are so delicious, thanks for the recipe!! Can these be made ahead and frozen, or formed into balls and refrigerated a day before baking? I love these and am planning ahead for the holidays? Thanks! Hi Amanda, SO sorry- for some reason this comment went to spam and I feel like it might be too late to respond (but I’m going to do it anyway!) I’ve never tried but I think you might have better luck with freezing then refrigerating. My only concern would be that they would dry out/soak up for liquid, then you would want. If you ended up trying- I’d love to know! Feta maybe? Something with a nice flavor! These look AMAZING. Going to try. What a great website you have. I make these all the time, and they are always a hit. It’s high time I left a review for them! Love, love, love! 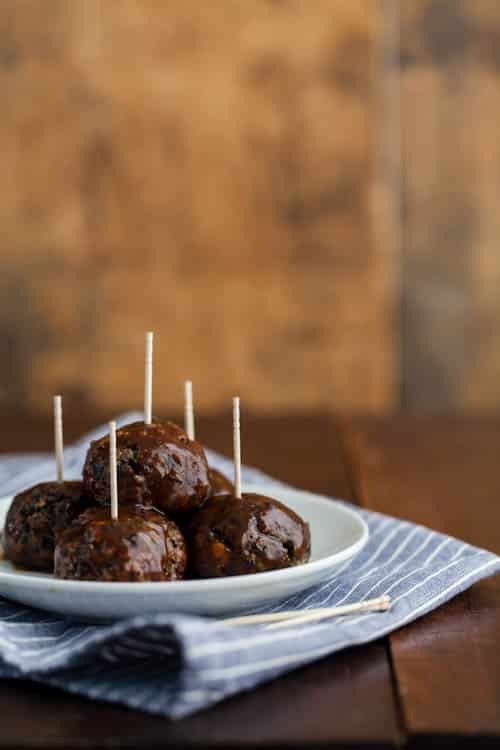 I am hosting a meatball cook-off party and thinking about making these. 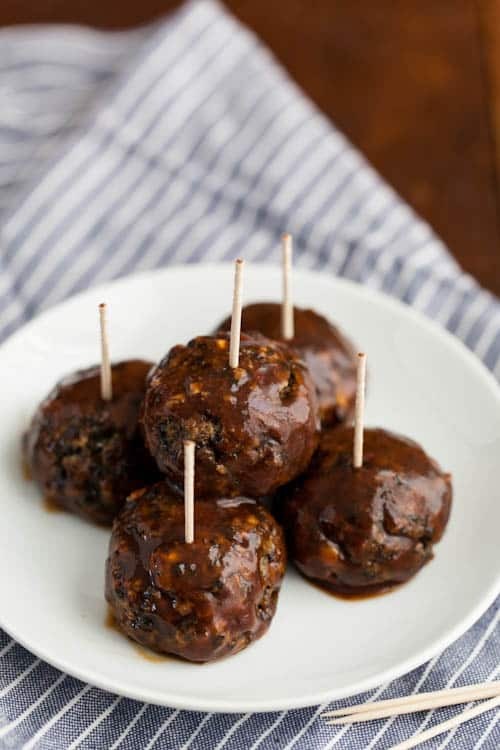 Only issue is that the theme this year is foreign recipes; so I think I am going to try this with La Puy Lentils, add pureed walnuts to the balls, use Roquefort cheese, and instead of the paprika, add espellete pepper for a french lentil ball. Not sure if I want the BBQ sauce, a buffalo sauce seems to pair better based on other tests with blue cheese. Can I use brown lentils instead of black?